First I painted with a metallic acrylic paint all the pieces on both sides. Once the paint was dry. I added some Distressed ink with a sponge dauber. I covered the mannequin in a paper dress made from some Robin's Nest paper. I added more ink. All the pieces were assembled and glued together. The metal and paper decorations, glitter, and thread were glued on. A final spray of some Shimmering distress ink was sprayed to give the piece an aged effect. Chipboard Steam punk cage dress form from Gina's Designs. 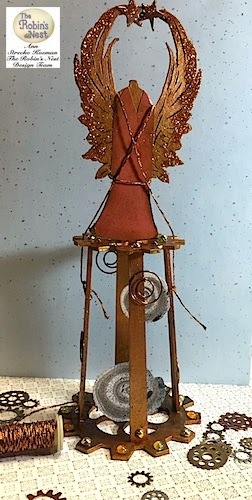 Please stop by the Chattering Robin's Blog http://chatteringrobins.blogspot.com/2015/05/altered-steampunk-cage-dress-form.htmlfor lots more ideas. Thanks for stopping by.